Fyodor Ivanovich Tyutchev was a 19th century Russian poet who literary historians consider to be the last of the great Romantics, the other two being Mikhail Lermontov and Alexander Sergeyevich Pushkin. He also translated the classics into Russian and spent many years working abroad as an official in the Russian Foreign Office. He was born on the 5th December 1803 into very comfortable circumstances in Ovstug, which is near Bryansk. He came from a family with long-standing noble roots and his parents allowed him to learn all about literature during his early years that were mostly spent in Moscow. He fell under the influence of Professor Merzlyakov and his literary circle from the age of 13 and he was soon translating works such as Horace’s epistle to Maecenas, this being published two years later. He was grateful to a personal tutor and minor poet by the name of Semyon Raich, a man who first encouraged the young man to take up poetry. Although Tyutchev became famous as a Russian Romantic poet, he was certainly influenced by the German movement whilst in Munich. He sought out the company of poets like Heinrich Heine and the philosopher Friedrich von Schelling. It was not until 1836 that he had a selection of his poems published in a literary journal called Sovremennik, a publication that was edited by Pushkin. Initial public response was lukewarm and he was further discouraged from writing more following the death of his first wife, Eleonore, in 1838. His poetic output virtually dried up for at least ten years, although he did write a number of political articles, outlining his views on Russia’s place in the world order. Tyutchev wrote at least 400 poems in Russian, and yet his name was little known in literary circles at home. Perhaps he was to blame for that, not having any great ambitions to become a published poet. Eventually, though, his work became better known and some of his short pieces have often been quoted in relation to the Russian Romantic literary movement. 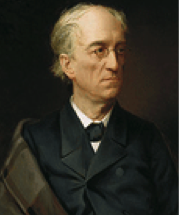 Fyodor Ivanovich Tyutchev died in St Petersburg on the 27th July 1873. He was 69 years old.